46 wins for Vermont cheeses at the American Cheese Society Competition, with blue ribbons for Vermont Creamery, Jasper Hill and Farms for City Kids. All in all, it was a fantastic night for Vermont cheesemakers. Vermont cheesemakers took home 46 of the 355 ribbons awarded at the 2015 American Cheese Society Competition, including 13 for first place. Vermont Creamery, Jasper Hill and Farms for City Kids took home a combined 8 first place ribbons, with Vermont Shepherd, Cabot Creamery, and Sweet Rowan Farmstead each earning a first place win. Overall, 22 different Vermont cheesemakers placed at the annual competition, known as “Oscar Night” for the American cheese industry. 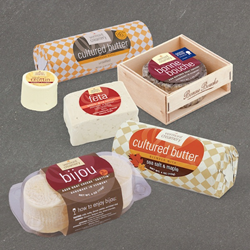 Vermont Creamery’s Cultured Butter with Sea Salt & Maple and Bijou won first place, Bijou for the second year in a row. Jasper Hill took home first place ribbons for Winnimere, Cabot Clothbound Cheddar, Cabot Clothbound Cheddar Select, and Harbison, which also took third place for Best of Show. Farms for City Kids earned two first place wins for Tarentaise and Reading. A complete listing of winners can be found on the American Cheese Society Competition website. The annual American Cheese Society Competition celebrates the very best of American cheeses and cultured products. Thousands of entries are judged on both technical and aesthetic criteria across multiple categories. For more information, visit http://www.cheesejudging.org. Combining the European tradition of cheesemaking with Vermont’s terroir, Vermont Creamery’s line of fresh and aged goat cheeses, cultured butter, and crème fraîche have won over 100 national and international awards. In their 30th year of business, Vermont Creamery supports a network of more than 15 family farms, promoting sustainable agriculture in the region. B Corp Certified in 2014, Vermont Creamery is the founder of Ayers Brook Goat Dairy, the country’s first demonstration goat dairy. For more information, visit http://www.vermontcreamery.com.